The “Advanced Fire Weather Forecasters Course Orientation” module introduces the organization of the course, the topics presented, and the intended audience, as well as the motivation for converting this course to online training. This web module is part of the Advanced Fire Weather Forecasters Course..
very well presented , very clear learning objectives and intended audience. It looks like A good progression to S-290. Great way to establish a course. At the end of this module you should be able to: 1. 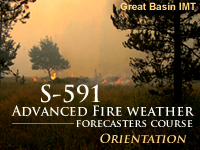 Describe the structure of the Advanced Fire Weather Forecasters Course and component modules.